What specific water-challenges can we find in Peru? How can corporate water stewardship concepts help resolve these issues? What does the corporate water stewardship community have to learn from the Peruvian experience? How can companies meaningfully engage with their suppliers to encourage more sustainable water management practices? How can companies ensure that their partnerships and collective action projects have integrity and fulfill their intended mutually-beneficial objectives? How can companies understand whether their stewardship efforts sufficiently address local water stress and other water-related challenges? In Peru, despite great progress, many challenges still derive from a lack of government capacity to robustly govern water resources. Collaborative action is needed among government, business, and civil society to support such capacity. As with companies from all corners of the globe, in order for many Peruvian businesses to effectively and robustly manage water-related business risks, they must 1) collaborate with others and encourage and facilitate improved water management beyond their fencelines and 2) proactively assess and respond to risks related to their supply chains. Supply chain management is particularly important for companies with extensive agriculture inputs; thus driving sustainable agriculture is an essential element of many water stewardship approaches. Activating social participation in the development and management of business operations, though often requiring significant time and investment, can be an effective strategy for “de-risking” business projects and improving a company’s standing among its stakeholders. The second daylong conference featured multi-stakeholder sessions exploring 1) policy engagement and collective action; 2) human rights and business; 3) corporate water disclosure; and 4) supply chain management and sustainable agriculture. Participants learned about the Mandate’s past and upcoming products, while also offering feedback on how they might be used to drive meaningful change on-the-ground, how the products themselves can be further strengthened, and how the associated Mandate workstreams can and should proceed in the coming months and years. 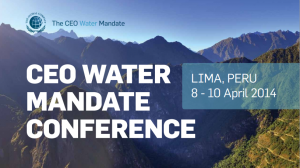 Coinciding with the Mandate’s conference, the Alliance for Water Stewardship (AWS), for which both the Pacific Institute and CEO Water Mandate serve as founding members, launched its water stewardship standard. It also reported on the outcomes and lessons learned from pilot testing AWS’ beta standard, including in Peru’s agricultural sector. The AWS Standard is a globally-consistent framework that outlines the expectations of responsible water stewardship that can be adopted by businesses and others. My main take-away from the event was that interest in corporate water stewardship – among companies and their stakeholders alike – has only grown in the last several years. However, discussions at the meeting also suggested that we clearly still have not achieved the type of change we’re hoping for. Peruvian companies and government officials speaking at the event noted a lot of great examples of stewardship efforts in Peru, while also pointing to the need to significantly scale up these practices. In the years to come, we need to expand this conversation beyond the 100 or so leading companies to include those companies’ suppliers and industry sector partners. Moreover, we need to make sure conference discussions are translated into practical action on the ground. Tools like the AWS Standard and the Mandate’s Water Action Hub can help, but more action and resources are needed.